When it comes to understanding the fundamental economic difference the Internet provides over the non-digital age, it’s having access to the Long Tail, which is essentially anything and everything else that’s a ‘non-hit’ or ‘non-blockbuster’, but in sum is greater. You can learn more about the Long Tail in our previous four-part series. 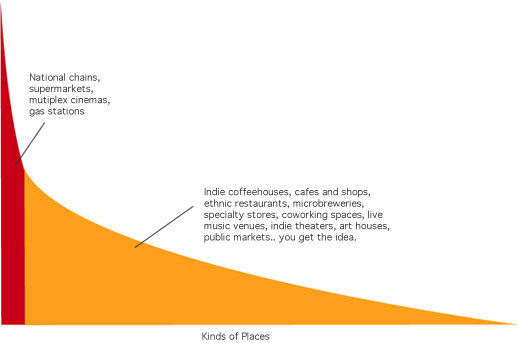 Note in the graph above, representing the mindset of creatives, that different kinds of places are listed from most popular to least popular, left to right. Of course, collectively, chains are the most popular venues in the U.S., shown in red, which dominate the suburban landscape. However, once you enter cities, you’ll see less of these chains and more diversity, the Long Tail, as represented in the color orange. If this were the standard population, the line delineating red from orange would be much further to the right. “Towns and suburbs… are natural homes for huge supermarkets and for little else in the way of groceries, for standard movie houses and for little else in the way of theater. There are simply not enough people to support further variety, although there may be people (too few of them) who would draw upon it were it there.